VA-75 was the first fleet squadron to operate the A-6E Intruder, but their legacy dates even earlier. They were established as VB-18 in January 1945, redesignated as VA-7A in November 1946, redesignated as VA-74 in July 1948, then finally named VA-75 on 15 Feb 1950. This name was earned by them due to the "Sunday Punch" they delivered on targets in their early days. Another AV8RSTUFF Creation: VA-75 was the first fleet squadron to operate the A-6E Intruder, but their legacy dates even earlier. They were established as VB-18 in January 1945, redesignated as VA-7A in November 1946, redesignated as VA-74 in July 1948, then finally named VA-75 on 15 Feb 1950. This is their 50th anniversary patch made just a few years before being decommissioned. Another AV8RSTUFF Creation: VA-75 was the first fleet squadron to operate the A-6E Intruder, but their legacy dates even earlier. They were established as VB-18 in January 1945, redesignated as VA-7A in November 1946, redesignated as VA-74 in July 1948, then finally named VA-75 on 15 Feb 1950. This is the light blue version of their 50th anniversary patch made just a few years before being decommissioned. 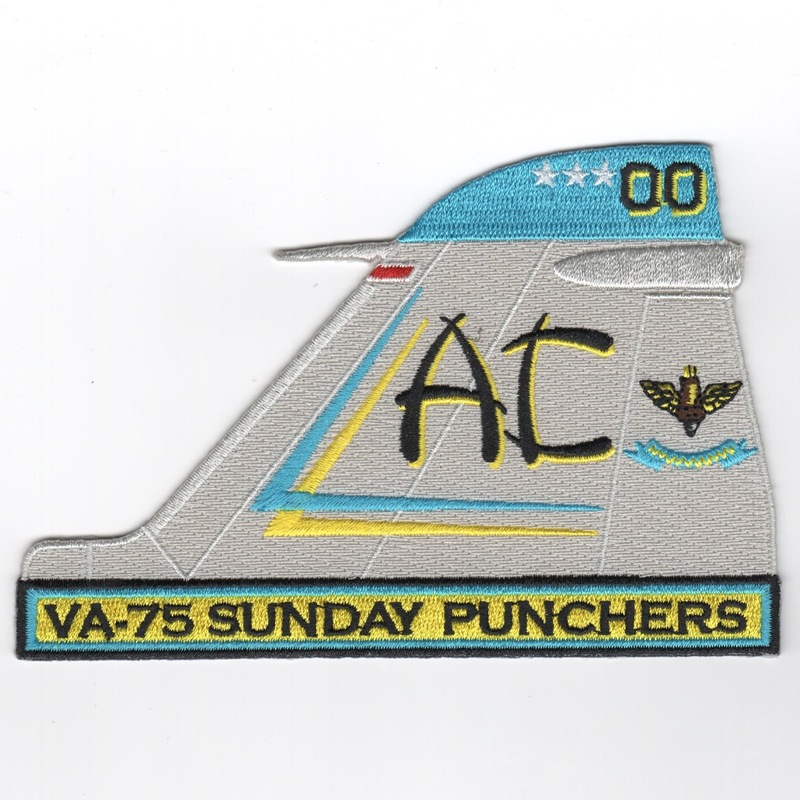 Another AV8RSTUFF Creation: This was the VA-75 Sunday Punchers farewell/ decommissioning patch. VA-75 was the first and last operational squadron of Intruders existing from 1963-97. Notice the "Puncher Glove" setting as the sun. 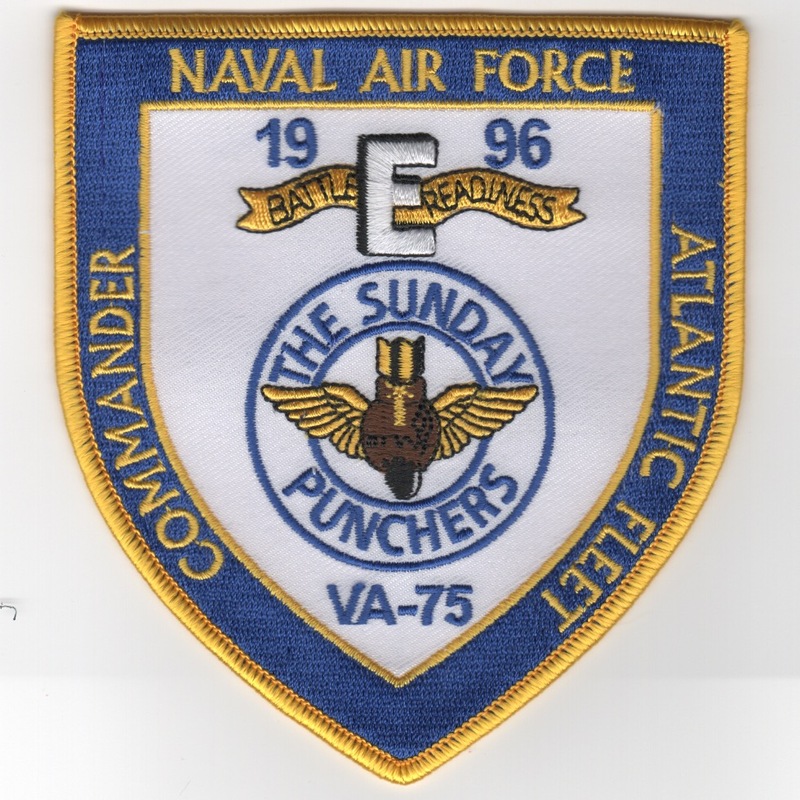 Another AV8RSTUFF Creation: This is the 1996 Battle 'E' Award patch earned by VA-75 Sunday Punchers for their last deployment in the A-6E Intruder, which was a "fun" summer-time Mediterranean cruise!! This patch does not come with velcro attached. 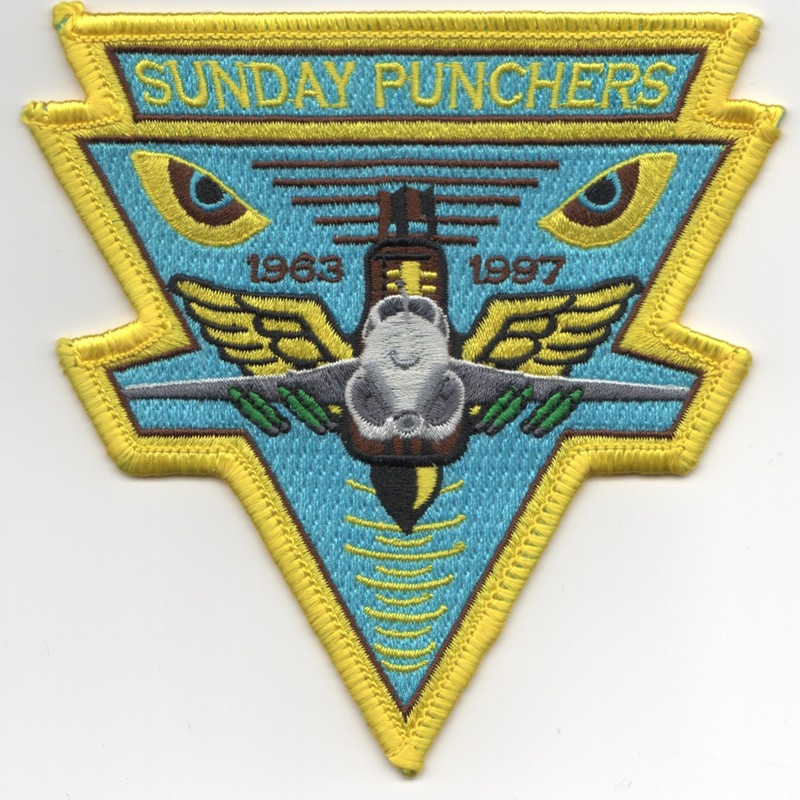 Another AV8RSTUFF Creation: When the Sunday Punchers decommissioned in 1997, the Coffee Mess Officer commissioned the creation of a few (VERY few) of these "Harley Wing-style" Jacket patches. 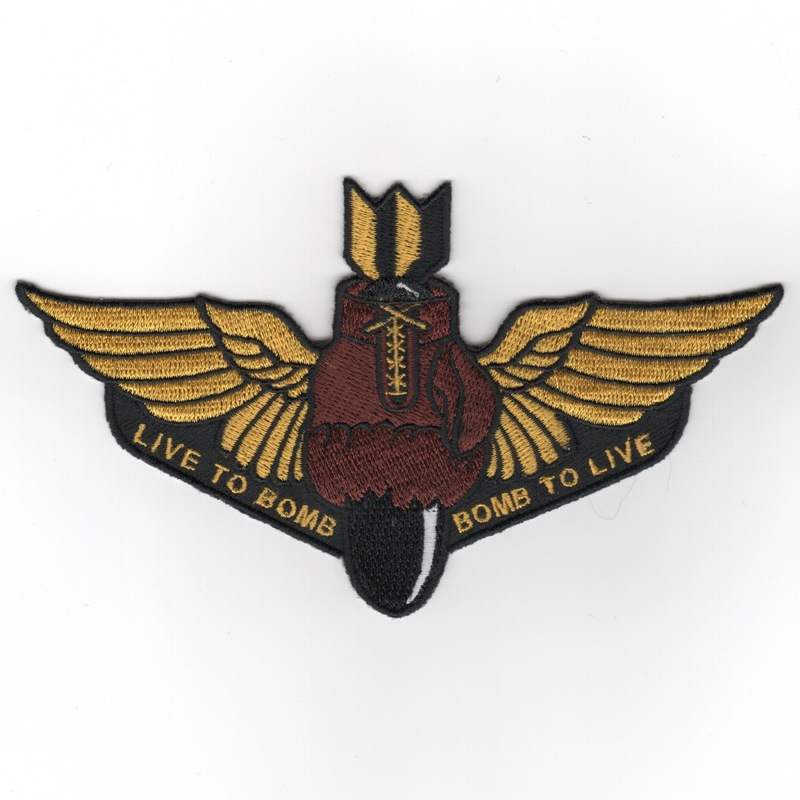 This one is 6" wide and says "LIVE TO BOMB, BOMB TO LIVE" and shows the squadron "Boxing Glove on Bomb" insignia. Only have a few of these also. No velcro on them. Size: 12" Wide - YUUUGE!! 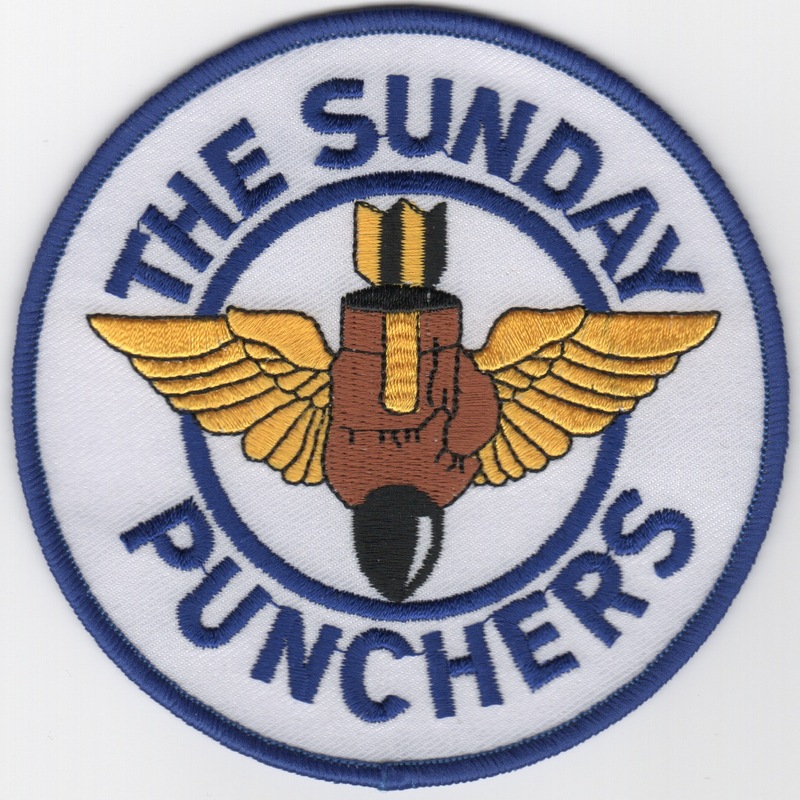 Another AV8RSTUFF Creation: When the Sunday Punchers decommissioned in 1997, the Coffee Mess Officer also commissioned the creation of a few (even FEWER than above) of these "Harley Wing-style" Jacket patches. This one is 12" wide and says "LIVE TO BOMB, BOMB TO LIVE" and shows the squadron "Boxing Glove on Bomb" insignia. It's a HUGE jacket patch (which is on my jacket) and I only have a few of these also. No velcro on them. Another AV8RSTUFF creation: This is the VA-75 Sunday Puncher 'EYES' Triangle made in the same design as the standard INTRUDER patch, but with the squadron's ORIGINAL colors. 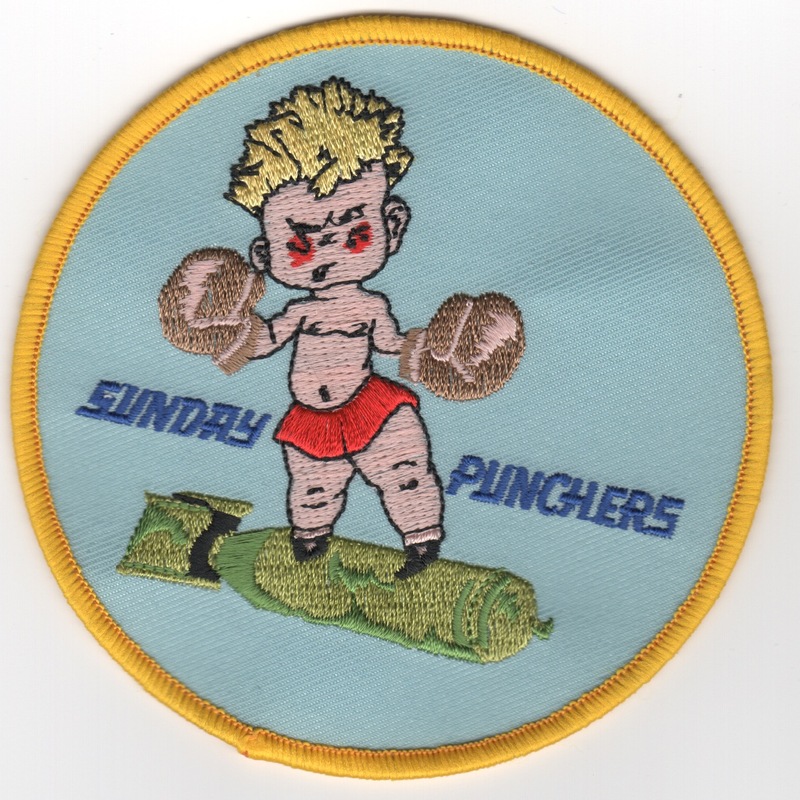 It has the dates 1963 - 1997, as the Sunday Punchers were the first and last Intruder Squadron....this patch does not come with velcro attached. VA-75 was the first fleet squadron to operate the A-6E Intruder, but their legacy dates even earlier. They were established as VB-18 in January 1945, redesignated as VA-7A in November 1946, redesignated as VA-74 in July 1948, then finally named VA-75 on 15 Feb 1950. This is the "Puncherboy" patch worn by the "most junior Officer" in the squadron, of which, since I was the last to get to the unit, was the "LAST Puncherboy" for over TWO years!! It's a reproduction of a rare patch....one that we couldn't wait to pass to the next, but in my case, I was the last one!! No velcro attached. Another AV8RSTUFF creation: This is the Sunday Puncher Intruder tailfin with the original color scheme that was seen in the 1960's. Gorgeous patch!!! (No velcro). Another AV8RSTUFF creation: This is the Sunday Puncher CUFF LINKS with the Squadron logo on the front. Another AV8RSTUFF creation: This is the Sunday Puncher 'Divot Tool' with a detachable ball-marker that has the Squadron logo on the front. If you golf like me, I usually have to use a small garden-spade to repair what I do to the golf course, but for all you "good" players, this is what you use to repair the 'divot' your ball makes when hitting the green....so I'm told...I never make the green in regulation! Another AV8RSTUFF creation: This is the front of the gray version of the Sunday Puncher T-shirt we had made from the original 1996 Decommissioning Party Design. We have limited numbers of the sizes listed, so please don't be upset if these sell out before we restock. Use this link to order, then specify in the "comments" section what size you would like, or just email/call me direct. XXL runs $2 more, I'll adjust on my end if needed. Sizes: See Above Another AV8RSTUFF creation: This is the back of the gray version of the Sunday Puncher T-shirt we had made from the original 1996 Decommissioning Party Design. Sizes: See Above Another AV8RSTUFF creation: This is the closeup of the logo on the gray version of the Sunday Puncher T-shirt we had made from the original 1996 Decommissioning Party Design. Another AV8RSTUFF creation: This is the front of the white version of the Sunday Puncher T-shirt we had made from the original 1996 Decommissioning Party Design. We have limited numbers of the sizes listed, so please don't be upset if these sell out before we restock. Use this link to order, then specify in the "comments" section what size you would like, or just email/call me direct. Sizes: See Above Another AV8RSTUFF creation: This is the back of the white version of the Sunday Puncher T-shirt we had made from the original 1996 Decommissioning Party Design. Sizes: See Above Another AV8RSTUFF creation: This is the closeup of the logo on the white version of the Sunday Puncher T-shirt we had made from the original 1996 Decommissioning Party Design. In Stock: NO, we order and make these!! Another AV8RSTUFF creation: We created LX vests for one of the Hornet squadrons for the 2018 Tailhook convention, so this got me to thinking about (arguably) the GREATEST INTRUDER squadron ever, and making one for us! Pictured is my vest as an example. The front (shown here, back is below) has several options. 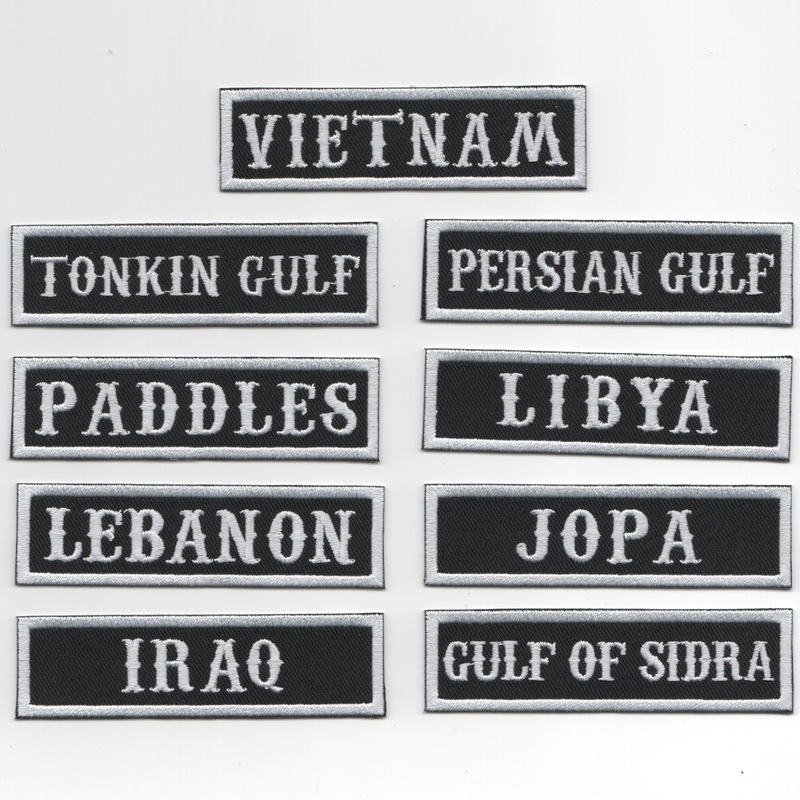 Names, Callsigns, Jobs, etc, then the back patches are shown below. THESE ARE NOT STOCKED, so I can order a LX Vest (from Amazon) for you, or you can send one to me, then I will have the patches added. Now, the pricing is going to vary based on the number of patches you want on the front, the back, if I buy the vest for you or you provide, and how much the local seamstress charges me. If you want one, I'd recommend calling me and we can walk through it all to make sure we get it just right for you. I take NO RESPONSIBILITY for any local Motorcycle Clubs (MC) getting offended, but many are veterans and would probably appreciate you honoring your squadron with their colors!! Questions, call me! 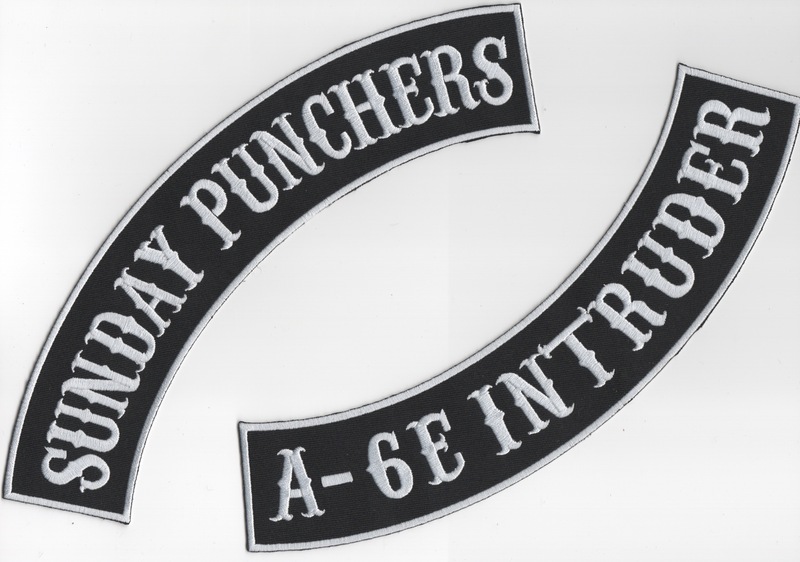 Another AV8RSTUFF creation: This is the back of the LX Vests for the Sunday Punchers we had made. See further details above. Another AV8RSTUFF creation: These are the "rocker" patches for the back of the LX vest. Top one says "SUNDAY PUNCHERS" and dthe bottom one says "A-6E INTRUDER". You can buy the whole package (above) or you can get the rockers here. These rockers do not have velcro attached. Another AV8RSTUFF creation: These are the "campaign" patches for the front of the LX vest. There are several to choose from and are in stock. If you need something "custom", then it will add about 4 weeks to get them done and will cost a little more. These do not have velcro attached. Homepage | Order VA-75 Patches!